Watch this WHSV news segment. 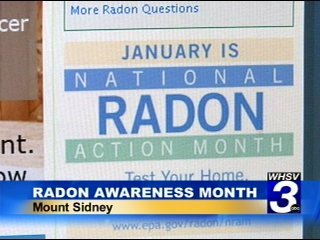 Radon is something you can’t see or smell but, you need to know about to keep your family safe. It’s a naturally occurring radioactive gas that is likely in your home and specialists say one in three homes in the Valley have unsafe levels. The rocky soil in the area makes homes, businesses and apartment buildings more susceptible. The radon comes from decaying uranium and thorium, which exist naturally in the soil and rocks. Continuously breathing in unsafe levels of radon is the equivalent of smoking numerous cigarettes per day. Keith Micallef, the owner of Accurate Home Inspections and a Certified Radon Specialist, says he has seen more people testing.